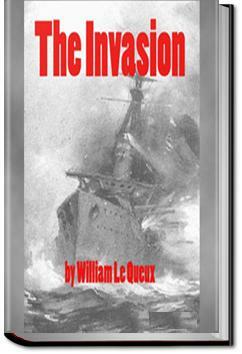 This novel, also known as The Invasion of 1910, is a novel written mainly by William Le Queux. It is one of the more famous examples of Invasion literature and is an example of pre-World War I Germanophobia, as it preached the need to prepare for war with Germany. The book takes the form of a military history and includes excerpts from the characters' journals and letters and descriptions of the fictional German campaign itself. . . .Essex—somewhere near Maldon—was now published. The statement had been dictated by Mr. Henry Alexander, J.P.,—the Mayor of Maldon, who had succeeded in escaping from the town,—to Captain Wilfred Quare, of the Intelligence Department of the War Office. This Department had, in turn, given it to the newspapers for publication. Please note that the 2007 edition is a reprint of the century old novel. This isn't a book in the usual sense of the word. If you're already familiar with the political and historical context of The Invasion of 1910, you can stop reading. You already know what comes next. Fascinating details regarding cities and towns in England, battle strategy, etc. Not great as a story, however. Fascinating 'what if' novel written with extreme detail. A book very much of its time. The narrative suffers at this distance of time with the lack of characters to draw the story along relying as it does on newspaper reportage to add colour to the military detail. A very dry read. Its not the best written book in the world. I'd say it is an interesting read for its history context. It is interesting to read into the paranoia about an aggressive Germany in the years running up to the First World War.